As Ebola Cases Spike, WHO Asks For More Money And Help : Shots - Health News The deadliest Ebola outbreak in history continues to grow in West Africa. Even as health leaders met to figure out how to stop the virus, the number of cases surged by nearly 20 percent in a week. Lack of awareness about Ebola has fueled the outbreak in West Africa. 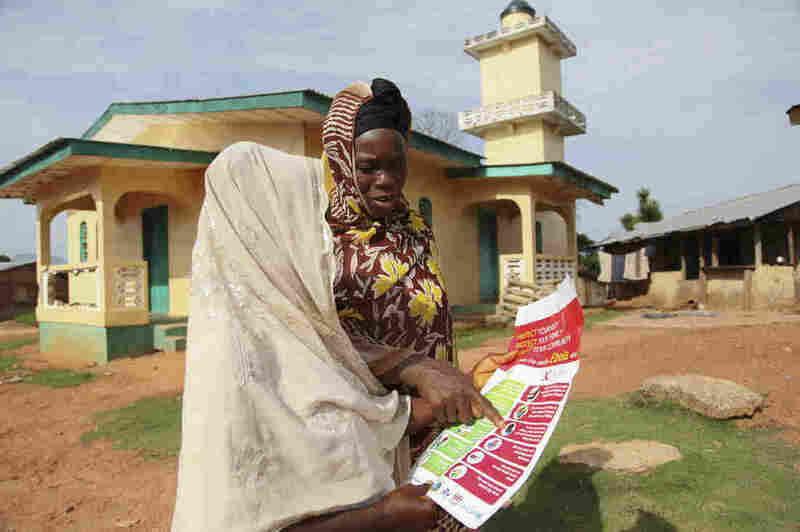 Here, two Liberian women in Lofa read a pamphlet about how to prevent the spread of the virus. The world's largest Ebola outbreak continues to surge at a troubling rate. The number of cases has climbed by nearly 20 percent in the past week, the World Health Organization said Tuesday. 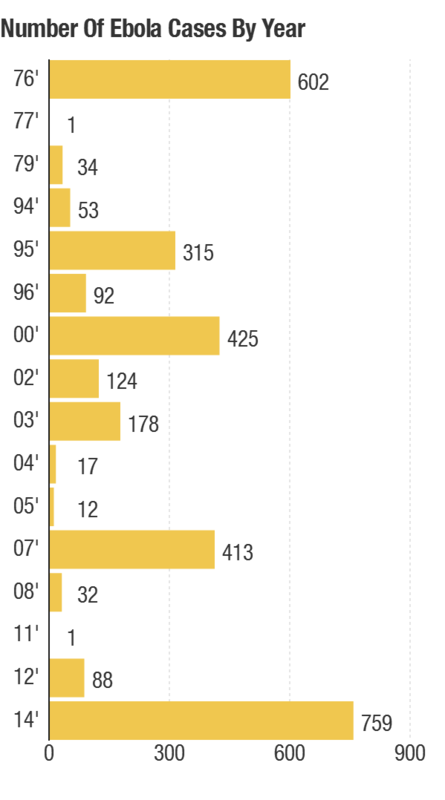 The 2014 outbreak is the largest on record. Values are as of July 1. At least 759 people have caught the hemorrhagic fever and 467 of those have died in three West African countries since March. The WHO has been so concerned about the disease spreading to other countries that the agency held an emergency meeting this week in Accra, Ghana. To contain this "unprecedented outbreak," the agency said Thursday, it needs more people on the ground to find cases, and to track down the family, friends, co-workers and other contacts of these infected patients. The agency called for more money and better communication among the countries involved. The WHO is also setting up an Ebola control center in Guinea to coordinate the effort. As NPR's Jason Beaubian explained Thursday on All Things Considered, while the outbreak shows signs of slowing down in Guinea, it continues to expand in Liberia and Sierra Leone. Ebola cases have appeared in more than 60 cities and villages, some far-flung — up to 400 miles apart. That's about the distance between Boston and Baltimore. So why has this outbreak been so hard to contain? Many factors have come together to create the crisis. This is the first Ebola outbreak in West Africa. The illness has symptoms that are similar to other hemorrhagic fevers found in the region, such as Lassa fever. So it took weeks, perhaps even months, for doctors to realize people were catching the deadlier Ebola virus, and for these infected to be quarantined. That delay gave Ebola a jump-start. Since the virus is new to the area, doctors and other medical staff weren't initially equipped or trained to handle it — which slowed the response further. The leaders in many communities also weren't aware of the virus and how it spreads. The custom in many parts of West Africa is to wash a dead body before burial. Ebola is transmitted through bodily fluids. So many people have likely caught the infection during this practice. Travel and commerce along the three borders has also helped spread the disease from country to country. And the virus has reached densely populated urban centers, including Conakry, Guinea, where nearly 2 million people live. Finally, resources to fight the disease have been scarce. Some health workers in the affected regions have faced violence and protests. On Wednesday, the Red Cross in Guinea said it halted its Ebola awareness campaign after its staff was threatened. "Locals wielding knives surrounded a marked Red Cross vehicle," a man with the nonprofit told Reuters, asking that his name not be used. "We've suspended operations for safety reasons," he said.